Garfield Angove was arguably the best harmonica player to come out of Detroit, a city loaded with great harpers, in the last 30 years or so. 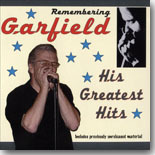 Remembering Garfield - His Greatest Hits (Eastlawn Records) is a taster of his brilliance. Opening with Dave Alvin’s swinging "Flat Top Joint," which reminds of some of the best Hollywood Fats, his command of the tiny instrument is impressive. The backing band, including Kenny Parker (guitar) and Shawn McDonald (piano) is equally stellar. The Little Walter piece, "My Baby Is Sweeter," again accented by guitar and piano, is a slow, deep blues. The harp is fat and full. Angove was a first class vocalist, as well. There are 16 killer tunes here. The first five are by the Detroit Veterans (Parker, McDonald, Mike Marshall-bass or Bob Conner-string bass, RJ Spangler or Pete Berg-drums). "Too Hot For Me" and "Your Girl’s Gone Bad," both Kenny Parker numbers, and Garfield’s "Under Blue Neon Stars" are classic swingin' and rockin’ blues and knock-out harmonica sizzlers that show off Parker’s guitar licks as much as Garfield’s harp. The Millionaires was one of the most popular bands in town back in 2010 when the next five were recorded. Garfield, Conner, Don Greundler or Dave Marracio on drums, Doug Deming guitar), Roy Wachtel and Larry Lamb or Steve Wood and Mark Berger on saxes, Andy Wickstrom (trumpet) and Mark LoDuca (piano). Their versions of "Keep A Dollar In Your Pocket," one of the standout tunes on the collection, and "It’s Obdacious" are first class. The addition of the amazing Jim McCarty on the Stooges’ "No Fun" is all kindsa fun. The Kenny Parker Band, with Tim Brockett or Chris Codish on keys, Bob Conner (bass), Mike Marshall (electric bass), Rene Gonzalves (drums), Larry Lamb on tenor and Andy Wickstrom on trumpet are represented here with "Yes Indeed" (the title of Parker’s fantastic album from last year) and a killer take on Little Walter’s "Can’t Hold Out." Various incarnations of The Garfield Blues Band check in with Chuck Berry’ "You Can’t Catch Me," Lowell Fulson’s classic "Reconsider Me" and Jackie Brenston’s groundbreaking "Rocket 88." The closer, an original by the Detroit Blues Band, "Friday the 13th," is akin to Little Walter’s "Juke," and is the perfect bookend to a phenomenal collection from a great musician who is greatly missed. One of the standout albums from the very fertile Detroit blues scene.